Perhaps in many countries, one of the most popular outdoor activity is fishing. 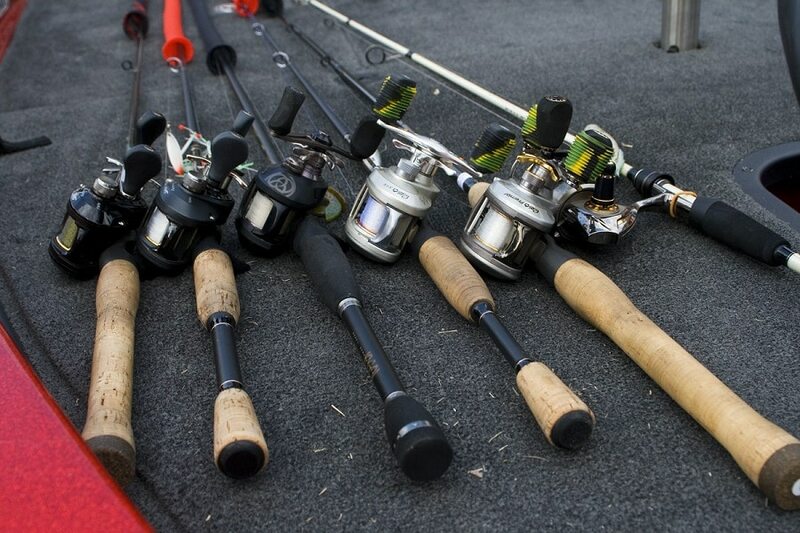 In this article, today we are looking at how to string a fishing pole. It usually doesn’t matter whether you are camping somewhere for a couple of days or maybe you are just trying to escape the urban life for the weekend. Fishing has always been seen as a very exciting and also a relaxing activity. It may also be considered a social activity when you are accompanied by a friend or just a family member. One of the key things in fishing that you should even before thinking about it is most definitely learning how a fishing pole can be stringed. You first need to get your rods stringed before you continue to prepare your line with weights and lures. Once you have done all these, you can try casting your line now. Also, it is usually very important that you understand the reels and the lines sometimes are not the same. Over the years, the fishing has been developing and nowadays we can see the equipment we are having today might make even first timers to feel a lot confident when going out trying to get some catch. This is not actually a very difficult task. If you are a first-time learner trying to get a grasp of how you can string a fishing reel, first you need to know what type of reel you are planning to use. Out there on the market, you can always find various different types of reels. Spinning reels, these usually offers much accuracy and are often easier to use as compared to bait casting reels. This is actually the main reason why these type of reel is the most popular of them all. Bait casting reels will greatly work with heavier lines while spinning reels requires lighter weight lines. Bait casting reels, this is a little bit tricky to use since the spool keeps on spinning every time you cast. For someone with a lot of experience in fishing, then this reel can be highly accurate. The amount of skill required for this reel is usually what makes a lot of first-time learners to choose other types which are easier to use. Spin cast reels, these reels always have a closed face basically because all of its components are enclosed inside a cone-like shaped case. In the casing, there is a certain hole that will allow the line to go out. This is also easy to use reel but the only issue is that it may not offer the much-needed accuracy or even offer much distance compared to the other types. Before you even start thinking about spooling a fishing reel, you need to learn and know more about the different types of fishing lines available. There are different types of fishing lines that are specifically designed for various types of fishing, fishing rods, and conditions. The braided lines have now been in existence for more than 1000 years. They also date back to the prehistoric times so there really isn’t anything new with them. The braided lines basically consist of woven multiple fibers which are thinner and less visible when in the water. This is something that has been improved over the years thanks to the modern technology. 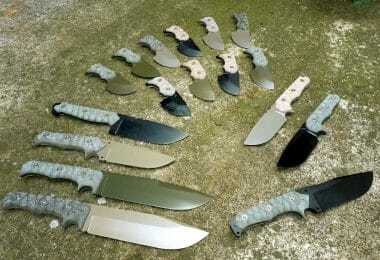 The older version used during the prehistoric times were bulky and were also quite thick. For these fishing lines, there are always different manufacturers some of which are offering unfused braided lines. These are softer but provides the same level of strength as the other ones. We also have the monofilament fishing lines, these are mostly used by learners due to their ability to hold very well to the reel spools and not slipping within a knot. These monofilament lines are always made from the materials which are often less visible to fish thus making it easier for them to get trapped. Another good thing about these monofilament fishing lines is that they can stretch a lot and they also do have a memory. This means that they usually take on the rounded or the curly shape for as long as they are stored on the reel. There is also the fluorocarbon lines, compared to those other fishing lines that we have mentioned above, these are relatively new. They usually have less memory than the monolines thus they just keep a straighter shape. Both the density and the weight of these fluorocarbon lines means less slack. Those having a lot of fishing experience, however, recommends this type of fishing line for bait casting reels. If fishing is your hobby, then you must know that this activity is not always about casting off your equipment into the water. It is also about learning and knowing how to string the fishing reel and how you can maintain the fishing line you are using. A proper maintenance of your fishing equipment will make them last longer and efficiently serve you as long as possible. The following tips might help you avoid an early respool. As obvious as this might sound, just don’t miss the eyelet. Many times a lot of people accidentally sometimes run the line between the eyelet and the frame when they are supposed to make the line go through the eyelet itself. This mistake might cause you some serious damages. Lures that are tightly strapped and are left on the line during storage might weigh down on the line. This might lead to the line developing kinks. When tying and untying the knots, it is recommended that you wet the line first. Using a dry line causes friction which in turn causes heat that will damage and break your line. You might also consider doing a regular check up on your line for any damages. Cheap lines compared to the high-end varieties do not always last as long. You might also try using the braided lines as they are among the most durable lines on the market. This calls for a thorough line inspection before you cast off. If you fail to do so, this could cause your great catch to get away. Line overruns can also be experienced if you are one of those people who goes fishing regularly. You might be tempted to pick apart the twists and the tangles but you need to be more careful when doing this, otherwise, you might even create more kinks. If in any case, you might be interested in doing some research on how you can spool a fishing rod, you will realize that a lot of experts do recommend that you stick to some correct storage and care practices. Obviously, a well-maintained fishing line will actually last longer, right? Maintaining your fishing line will help you not to do a restring anytime soon. With various types of fishing line, there is also different kind of treatments for them. Let us look at some of these practices. 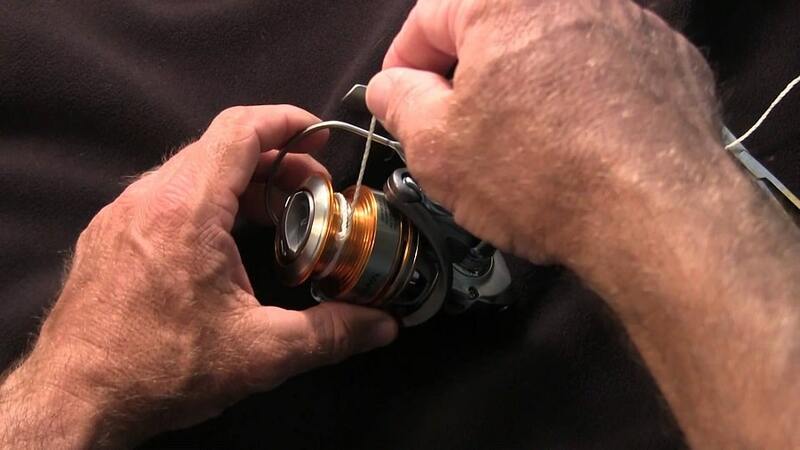 For the fly-fishing lines, you will need to remove them from the reel and use a soft cloth to wipe them clean with. This can be done by using some special cleaners before lubricating them with a special dressing. 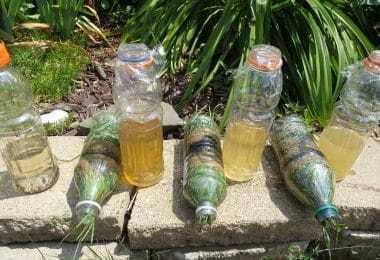 After doing all these, you can then use a large plastic container, something like a coffee can and wrap the fly line around it. This might help you in reducing the memory and then use a cardboard box to store it in a cool and dark area. 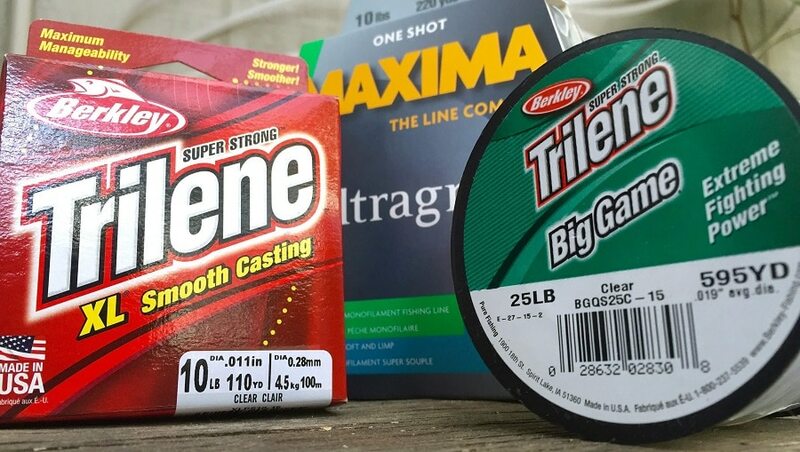 For both the braided and the monofilament lines, you can wound them up on the spool then use a rubber band to hold them in place. These can also be placed in a cardboard box that is labeled and place it in a cool and dry place. Make sure that they are loosely wound. You can use a regular dishwashing liquid to clean them up with. What about the fluorocarbon fishing lines? You can treat and clean them using a specific lubricant then store them just on the reel. Before you go out for your next fishing trip, you should remember to lubricate them again but this time, you can just spray the lubricant onto the reel. This will save you some time instead of unspooling then respooling back the line. This is something you can do as you head out to your favorite spot. The reel you are planning on using will determine the method you are going to use when stringing your fishing line. You must be keen enough and only choose the correct line for your reel. Also, you will need to take into considerations some vital details like the line length and its strength. You must also consider the water currents as the strength of the line you want to use will not only relate to the weight of the fish. 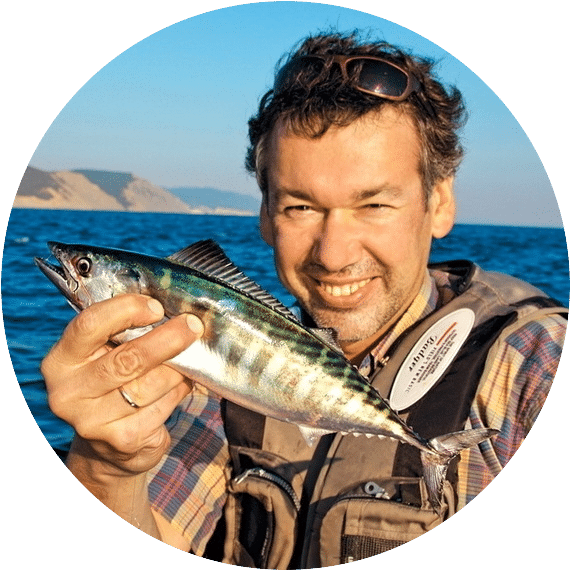 You will probably need a stronger and tougher line when fishing in stronger currents, lines which are not going to break under the water pressure and the weight of your impressive catch. For more detailed instructions, check out our piece on how to properly string a fishing pole for your reference. Well, with that being said, let us look at the different ways in which you can string your reels. The first thing you need to check before you even start is the direction the ball is rotating in. Some may rotate in the clockwise direction while others may rotate in the opposite direction. This all depends on the brand. You also need to check the direction in which the new spool unwraps. You must ensure the spool unwinds in the same direction that the reel is rotating in. This will help you to reduce the twists in the line. You may be required to flip over the spool to make that is if they don’t match so that you can make them match now. Failure to do this might result in your line having some kinks hence you will experience some trouble when casting off. On the reel, make sure you wrap the line around it only once then a simple overhand knot should be tied to the main line. Close to the loose end tip, tie another knot. This helps you prevent the line coming undone. The excess line should then be trimmed off from the loose end once the line is already tightened around the reel. As opposed to the bulky knots, a low diameter line is usually best secured with an electrical tape. 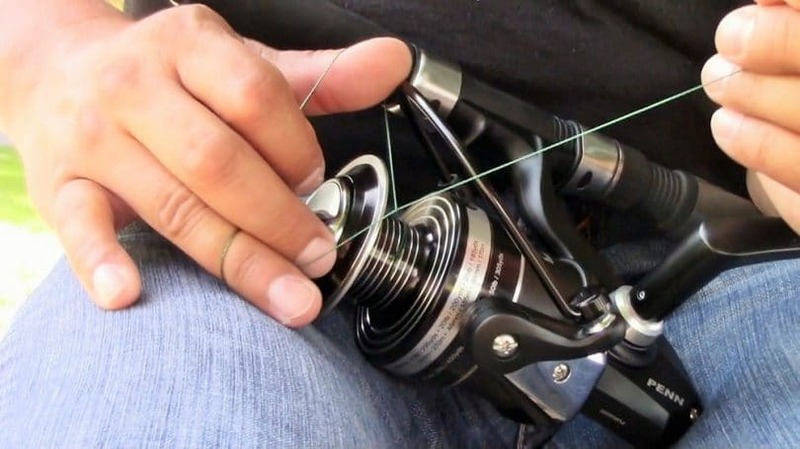 For your line to maintain some sufficient tension while reeling a few feet onto the reel, holding it between your two fingers will help you with this. Having done all these, you need to test it now in order to see if the line is coiling in the same direction as the reel. 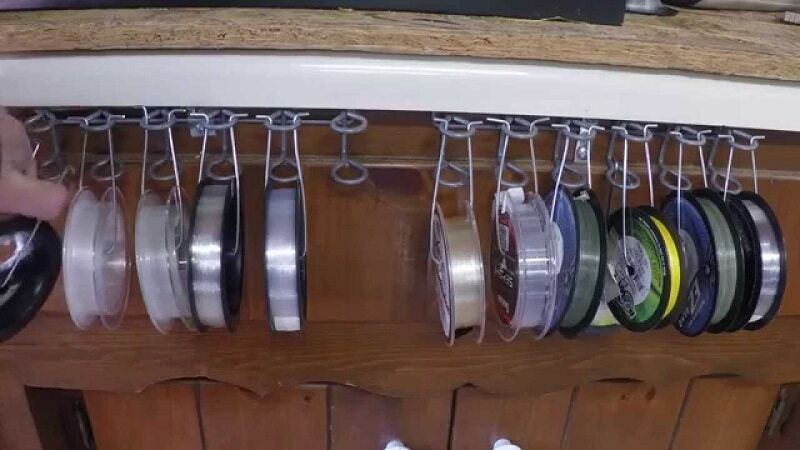 This can be done by tipping your rod in the direction of the new spool on the floor. If it is not then you will need to start over again. One and perhaps the most important tip to remember is, always ensure you use a soft, clean cloth when holding the line. This might help you to reel faster without getting yourself hurt. Make sure to fill the reel to approximately 1/9 inch from the rim. 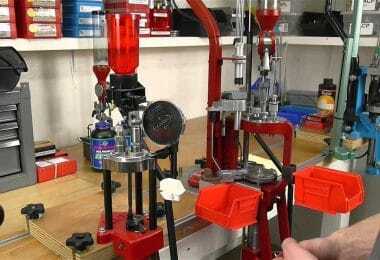 Usually, this is done by two people, that is if you do not have a filling station for reels. Using a pencil, place it inside the new spool then ask a friend to hold it for you or you can also go ahead and buy a reel filling station and use it. Also, you will need to check again both the direction of the reel and the direction of the spool and ensure that they do match. Through the line receiver, keenly slide the line and pull it through all the way. Here you will also need to trim off the excess line on the loose end after tying and securing the line. Gently cast the line off the spool and onto the reel after securing it between your two fingers. Keep in mind that you need to maintain a certain amount of tension for your line to be wrapped snuggly around the reel. Overfilling your reel would not be a good idea so make sure you stop approximately 1/15 inch from the reel’s top rim. Be sure to check YouTube video above. On the reel, check its capacity, this is usually printed on it. Take off the closed face of the spin cast reel. Before respooling, you should be able to check and remove any remaining line available. You must ensure the direction of both the reel and the spool are matching. Find the small hole just in the face of the reel and slide the line through it. Before running the end of your line to the reel through the rod guides, you should be able to have lifted the bail arm. To secure the line to the reel, you need to wrap it around the reel and tie an overhand knot just around the main line. You must also tie the second knot a little bit closer to the tip of the free end. This will help in preventing the line from coming loose. The excess line from the loose end should then be cut off. Screw back the face you removed first before you continue. Hold the line between your two fingers keeping it nice as you continue the reeling up to a few feet on. To check how mush reeling you have done, you should remove the front cone. Also, make sure you don’t overfill the reel by leaving approximately 1/9 inch from the top. Finally, screw back the cone and run the line through the remaining guides on the rod and you will be good to go. 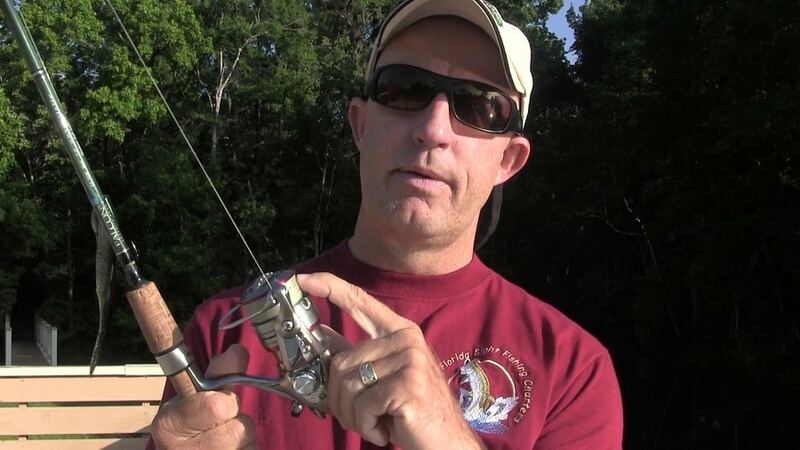 And check in the video above some tips for stringing spin cast reels. For the fly reels, things are a little different. Here you will start by attaching your backing using an arbor knot. Through the reel, you will also need to thread the end of the line from the spool taking it all the way round. You should check and ensure you tie another knot just on the loose end to prevent the first knot from coming undone. From the loose end, trim off the arbor knot. Keep the line taut between your two fingers then spool the backing onto the reel. By using an Albright knot, you can then secure the end of the backing line to your fly line. Use a stick or a pencil to slide the spool. Avoid overfilling by leaving some space when spooling the fly line onto the reel. Finalize everything by attaching the leader line to the end of the fly. One more thing that you need to remember when stringing, is to always double check your knots, making sure that they are all secured and also make sure you trim off the loose ends before you continue. With all these am sure you can wisely pick the option that nicely suits you when you decide to try your hand at fishing, good luck. Before you embark on your next fishing expedition, check out our expert review of the best affordable fishing rods to save you money.